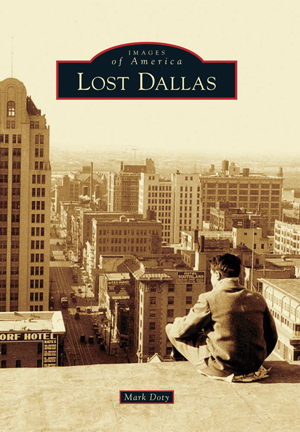 Showcasing the city’s lost landmarks, historic preservation officer Mark Doty recently authored a book entitled Lost Dallas. The book — part of Arcadia Publishing’s “Images of America” series — features more than 200 images of buildings that have been demolished throughout the history of the city. The photos help document decades of change in Dallas… from early structures surrounding the county courthouse(s) to suburban shopping centers. Proceeds from sale of books benefit the Dallas Municipal Archives, where many of the images were rediscovered. Over at the Dallas Center for Architecture, a corresponding exhibit has been designed to bring some of these stories to life with large-scale photographs and salvaged architectural artifacts. The Center has also planned an evening lecture by Mark Doty and special walking tour on the subject. 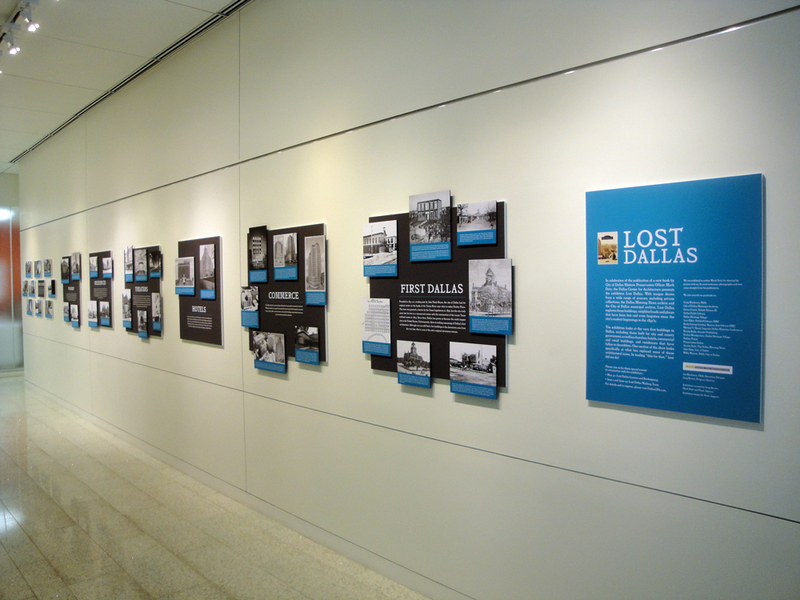 The Dallas Center for Architecture showcases images and artifacts from "Lost Dallas"
The illustrated losses are the results of several reasons: necessary improvements in a growing city, a shift of attitude and focus on downtown, or simply a change of architectural taste. The skyscrapers we associate with downtown Dallas today replaced many of the city’s earlier structures. 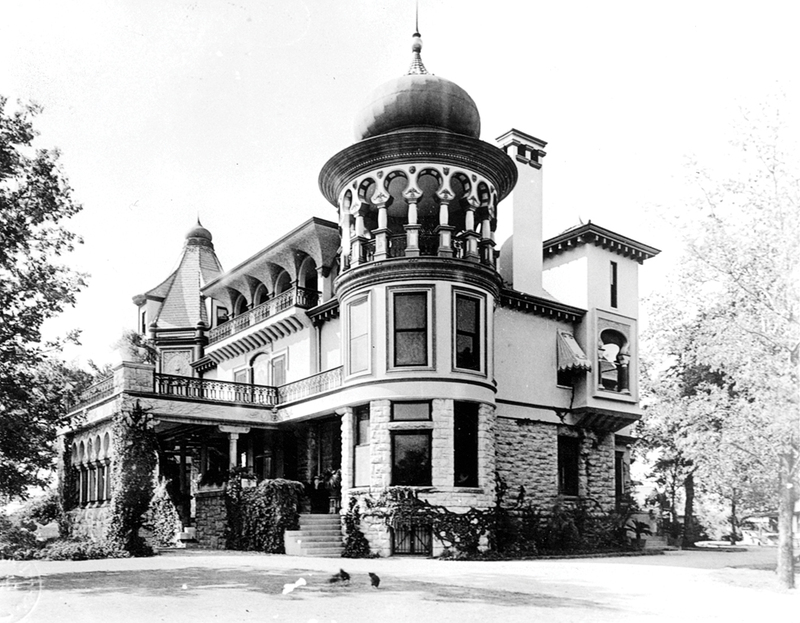 Beautiful mansions on Ross Avenue were demolished for auto repair shops as the city expanded outward. And dozens of structures city-wide were demolished for speculative construction projects that never materialized, resulting in gaps (most often parking lots) in our urban area. Some of these changes resulted in improvements to the site, allowing the city to evolve appropriately. Other losses are still lamented by long-time residents and those who tried in vain to preserve the city’s architectural history. For many years the “bigger, better, newer” way of thinking was a motivating force behind demolition; now, sustainability and economic incentives have a role in persuading owners to preserve some of these long-time landmarks. With the resurgence of downtown Dallas and demand for urban housing, many structures that could have been demolished have instead been recycled and restored for new life. 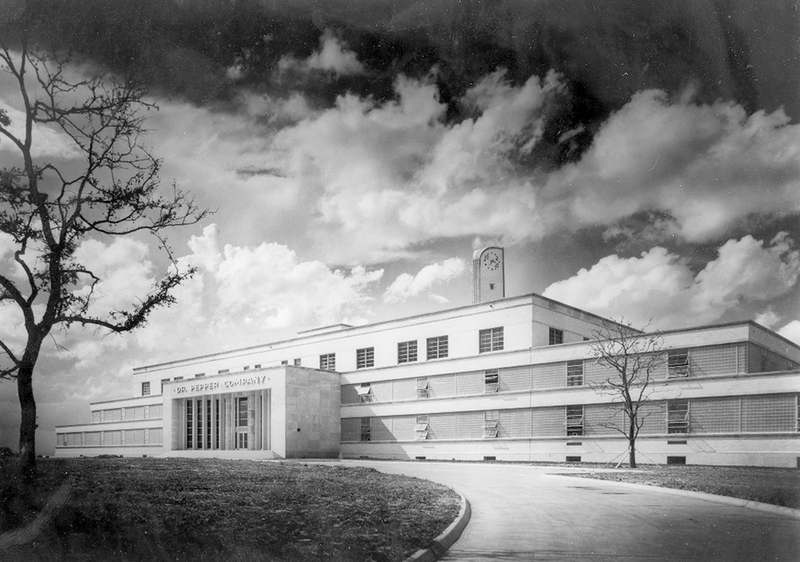 Through the support of municipal preservation programs, there are now numerous City of Dallas Landmark Structures contributing to the historic character of the city. There’s no doubt that more structures will be lost in the future as Dallas continues to evolve. Despite a sense of loss, Lost Dallas allows us to remember and appreciate landmarks no longer with us while considering the worth of preserving today’s structures for future generations. 5 Responses to "‘Lost Dallas’ Explores City’s Demolished"
I am trying to figure out what theater in Dallas my parents took me to back in 1964-1965 to watch My Fair Lady (Audrey Hepburn movie)… I thought it was the Palace but when seeing photographs of the interior of the old Palace I don’t think that was the right one. I think the one we went to looked like it was in a big garden.. there were artificial trees high up on the walls with faux columns big huge urns and Greek type statues. It looked like we were sitting in a garden. The ceiling was a dark blue and it looked like we were sitting under the night sky because there were small lights in the ceiling looking like stars. During the showing of the movie there was back lighting behind the columns .. during intermission a man playing a pipe organ came up out of the stage… does anyone know what theater this was? I went to the Palace theater many times as a child, my uncle was the projectionist there! It was a gorgeous theater! I wish it was still there! My parents took me to the Palace during my childhood years, and my wife (of nearly 50 years) and I went there on some of our first dates. 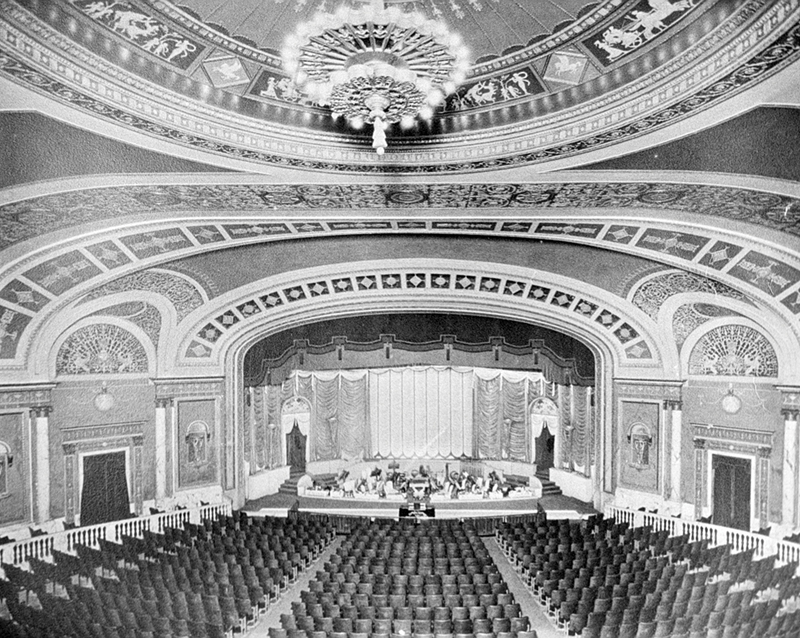 I not only remember the beauty of its interior, but its superb acoustics, which produced a spacious sound without any of the ‘ear-damaging qualities’ of virtually all of our modern theaters. I also remember the impressive ‘Mighty Wurlitzer’ played by Weldon Flanagan during intermission. Finally, there was a very touching personal memory, as my late father had played trumpet in the theater’s pit orchestra during the silent movie era. How could the City of Dallas destroy such an incredible theater?!! (Of course the legendary Carnegie Hall in N.Y.C. barely escaped demolition, in the 1980-‘s had it not been for Issac Stern’s aggressive intervention!